Two masked men, one armed with a knife, burst into a house and threatened the occupants before fleeing with stolen items, police have said. 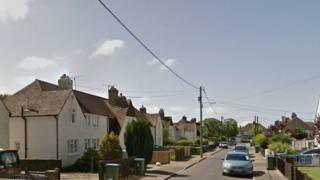 The robbery took place in Falkland Avenue, Littlehampton, West Sussex, at about 19:00 GMT on Thursday. Det Sgt Simon Smith of Sussex Police said: "The occupants involved were left shaken but thankfully unhurt." A Littlehampton man, 28, has been arrested on suspicion of aggravated burglary and remains in custody. Police said the suspects made off in the direction of Southfields Road with items including a shoulder bag, keys, a small quantity of cash and tobacco. They have been described as white, about 6ft tall and slim. One wore a dark hooded jacket and the other wore a white hooded top.